As great as Netflix is, its catalogue of titles shifts around all the time - pretty much the only movies you can guarantee to be on Netflix forever are those it's made itself. So if you want a digital movie, with no disc, that you can keep forever, then where should you turn? In fact there are more digital movie stores out there than you might think if you're struggling for something to watch of a Saturday night. Here we'll outline the best choices, plus a few of their pros and cons, so you can organise your purchases accordingly. 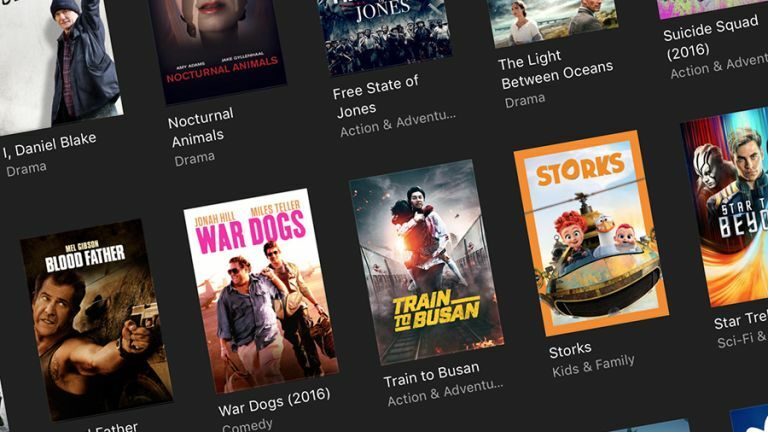 To give Apple credit, it believed in the dream of digital movies and music for quite a while before anyone else did, and its iTunes movie library is one of the most well-stocked around. From the latest blockbusters to old-timey classics, there's a huge choice. On the downside, the copyright-protection Apple builds into its iTunes movies means that for the moment you can only watch them on Apple hardware, or iTunes on a Windows machine. You can't queue them up on an Android tablet or stick a Roku stick in the back of your TV to watch them that way (you'll need an Apple TV instead...). Prices fluctuate all the time but to give you a general idea you can currently pick up recent Marvel superhero movie Dr Strange for £13.99 in HD, or classic dino action blockbuster Jurassic Park for £7.99 in HD. The iTunes Store is comprehensive and simple to use, and you can usually rely on Apple kit to play back your movies without any glitches or issues. Just be sure you understand the limitations in terms of where you can play these films before you go all-in with Apple's digital ecosystem. Apple's iTunes movie service is very Apple-y - only available on Apple hardware - and Google Play Movies & TV is very Google-y, so it's based on the web and can be streamed to pretty much any device you like, with no need to store files locally at all. That means plenty of smart TVs, iOS, Android, most of the most popular streaming sticks and boxes, and of course any computer with a web browser on it. If you do a lot of hopping between devices it's ideal. The web interface is a bit on the basic side but does everything you need it to. We found Dr Strange for £13.99 in HD (the same price as on Apple) and Jurassic Park for £9.99 in HD (£2 more expensive). HD can be watched on the desktop, on Chromecasts, on Roku sticks, and iOS devices, and on "most Android devices" accordingly to Google. Being able to get at your content from just about anywhere is the best reason to go with Google, though as you would expect from the makers of YouTube and Gmail, the performance is rock-solid and glitch-free. You can cache files locally on a device if you're going to be without internet for a while, and as an added bonus you can get at all your movies (and TV shows) through YouTube as well. Amazon's various video services aren't always that easy to understand, but you can buy movies digitally through Amazon Video whether or not you subscribe to Amazon's Netflix rival, Amazon Instant Video (sometimes called Amazon Prime Video) - clear? It works a lot like Google's movies and TV service, with the web interface the best starting point, and accompanying apps available for mobile devices, streaming sticks, games consoles and so on. The selection is pretty good as well, as you might expect from Amazon, with the latest blockbusters sharing virtual shelf space with well-known classics. The prices are comparable to the other services we've looked at - with HD copies of Dr Strange going for £13.99 and Jurassic Park for £7.99 - and thanks to Amazon's expertise in web storage and servers, you won't often have a problem with getting your movie purchases delivered to whatever device you want to play them on. The different app interfaces aren't quite as clean and intuitive as the ones available from Apple and Google, but in terms of movie selection and service stability, Amazon is pretty much on a bar with its big rivals. Whether or not you've got a Sky box at home or a subscription to Sky, you can access the Sky Store and buy movies to keep forever in digital format. If you are a subscriber then you can watch them on your box or online, but if not you can just watch them on the web. Apps for iOS, Android, Roku and Now TV are also available. Full (1080i) is only available if you've got a Sky box though, and you can't yet buy 4K movies from Sky. What you can do is subscribe to the Sky Cinema package in Sky Q and then record (and play back) films in the highest 4K (or Ultra HD) resolution, but as yet this format hasn't made it to the Sky Store or any of the associated apps. You need a Sky box, a 4K TV, and a Sky Q subscription, but then you can download or watch as many films as you like using your box. 4K will eventually roll out to the Sky Store and the other services we've mentioned here, but in the meantime a film like Dr Strange can be yours for £13.99 in HD (with a DVD copy included) and Jurassic Park will set you back £7.99 in HD (cheaper than Google and the same price as Apple). Sky Store doesn't quite have the breadth that Apple and Google can offer, and the apps aren't quite as robust, but it's a good option, especially if you've already invested in some Sky services. As yet, Virgin doesn't have a fully featured service like Sky does, though you can download and save movies straight to your cable box, and you can subscribe to Sky Cinema through the Virgin service.